Sometimes people still cite Orson Pratt's Book of Mormon footnotes to support either (i) their own hemispheric or Latin American geography theories or (ii) their theory that everyone in Joseph's day was an ignorant speculator and was wrong. Most people in both groups are Cumorah deniers. I'm not aware of anyone who accepts Orson Pratt's geography ideas completely. I think the footnotes show that Joseph's contemporaries all agreed that Cumorah was in New York, but realized they had to speculate about the rest. Pratt even uses speculative language when he refers to the South American locations, but he is specific and clear about the location of Cumorah. Because many people have never seen these footnotes, I'm providing snapshots of them from the 1879 edition. Brother Pratt also added explanatory footnotes about geography. These tell us a lot about what people who actually knew Joseph Smith were thinking, as I'll explain in a moment. I realize it takes a long time to fix this type of error, but I hope someone does it sooner rather than later. Overall, we see that Pratt was confident about some locations (crossing the Atlantic Ocean, the United States and the Hill Cumorah in New York) but speculative about other locations (everything in Central and South America). Joseph Smith rejected Pratt's hemispheric ideas, as we can see from the editing of the 1842 Wentworth letter. Later in 1842, an anonymous article in the Times and Seasons (T&S) claimed Zarahemla was in Quirigua, Guatemala. Neither Pratt nor anyone else ever quoted that article or attributed it to Joseph Smith, which suggests they knew Joseph had nothing to do with it. In fact, Pratt and others flatly contradicted the T&S articles when they claimed Zarahemla was in South America. The historical evidence, IMO, shows that William Smith and Benjamin Winchester collaborated to write the anonymous articles in the 1842 T&S. Other early Church authors also described variations of a hemispheric model. The only thing they agreed upon was that Cumorah was in New York, just as Oliver Cowdery and Joseph Smith said. 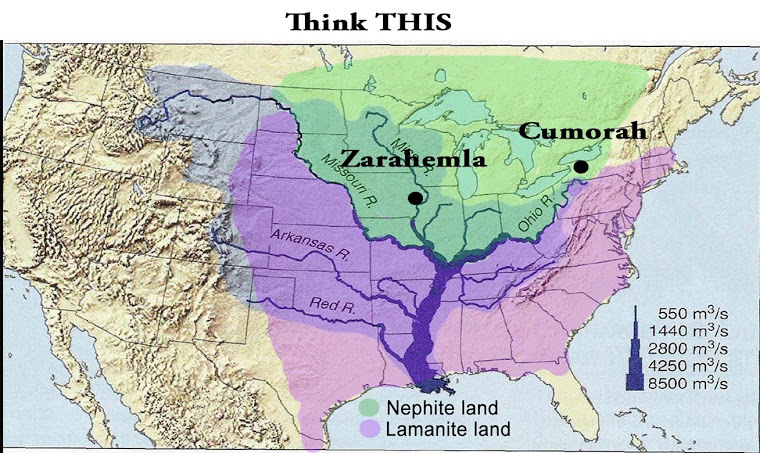 Only in recent decades have Cumorah deniers arisen in the Church who claim Cumorah was not in New York. We see from Pratt's footnotes that at least among those who actually knew Joseph Smith, there was no question about the New York location of Cumorah. His footnote about Cumorah says, "The hill Cumorah is in Manchester, Ontario Co., N. York." As you'll see, his other comments were more speculative. Here are some of Pratt's 1879 footnotes by chapter and verse, with my comments in red. 1 Nephi 13:10: And it came to pass that I looked and beheld many waters; (e: The Atlantic Ocean) and they divided the Gentiles from the seed of my brethren. And I beheld that their mother (j: The British) Gentiles were gathered together upon the waters, and upon the land also, to battle against them. 1 Nephi 22:7. And it meaneth that the time cometh that after all the house of Israel have been scattered and confounded, that the Lord God will raise up a mighty (d: The United States) nation among the Gentiles, yea, even upon the face of this land; and by them shall our seed be scattered. Mormon 6:2. And I Mormon, wrote an epistle unto the king of the Lamanites, and desired of him that he would grant unto us that we might gather together our people unto the land (a: The hill Cumorah is in Manchester, Ontario Co., N. York) of Cumorah, by a hill which was called Cumorah, and there we could give them battle. Ether 11:6. And there was great calamity in all the land, for they had testified that a great curse should come upon the land, and also upon the people, and that there should be a great destruction among them, such an one as never had been upon the face of the earth, and their bones should become as heaps (c: The ancient mounds of North America) of earth upon the face of the land except they should repent of their wickedness. The following footnotes use hedging terms such as "probably" and "supposed to be" instead of the unambiguous, affirmative statements such as the declaration that the hill Cumorah is in New York. 1 Nephi 18:23. And it came to pass that after we had sailed for the space of many days we did arrive at the promised (k: believed to be on the coast of Chili, S. America) land; and we went forth upon the land, and did pitch our tents; and we did call it the promised land. 13 And it came to pass that he did according as the Lord had commanded him. And they departed out of the land into the wilderness, as many as would hearken unto the voice of the Lord; and they were led by many preachings and prophesyings. And they were admonished continually by the word of God; and they were led by the power of his arm, through the wilderness until they came down into the land which is called the land of Zarahemla (h: The land of Zarahemla is supposed to have been north of the head waters of the river Magdalena, its northern boundary being a few days' journey south of the isthmus). Alma 2:15. And it came to pass that the Amlicites came upon the hill Amnihu, which was east of the river (g: Supposed to be Magdalena) Sidon, which ran by the land of Zarahemla, and there they began to make war with the Nephites. Alma 22:31. And they came from there up (2q; Into Bountiful and Zarahemla, South America being called Lehi, and North America, Mulek) into the south wilderness. Thus the land on the northward was called Desolation, and the land on the southward was called Bountiful, it being the wilderness which is filled with all manner of wild animals of every kind, a part of which had come from the land northward for food. Ether 9:3. And the Lord warned Omer in a dream that he should depart out of the land; wherefore Omer departed out of the land with his family, and traveled many days, and came over and passed by the hill of Shim, and came over by the place where the Nephites were destroyed, and from thence eastward, and came to a place which was called Ablom, (d: probably on the shore of the New England States) by the seashore, and there he pitched his tent, and also his sons and his daughters, and all his household, save it were Jared and his family. Ether 15:8. And it came to pass that he came to the waters (c: supposed to be Lake Ontario) of Ripliancum, which, by interpretation, is large, or to exceed all; wherefore, when they came to these waters they pitched their tents; and Shiz also pitched his tents near unto them; and therefore on the morrow they did come to battle. Fantastic! I am constantly amazed at how much research you've done on Book of Mormon Geography. We don't know where Cumorah is?